An open letter to Rassie Erasmus. Congratulations! There are many of us that are very pleased with your appointment as Director of Rugby at SA Rugby, and as successor to Allister Coetzee as the National Coach too. Whilst Allister is a very nice chap, the weaknesses in his coaching cupboard were cruelly exposed during his two years in charge, and there is no doubt that a change was needed. We welcome the change, and we are quite pleased that someone with your credentials has been appointed to do the job. Rest assured, we are on your side! There are, however, just a couple of questions that we need to ask you. We were wondering whether there was a selection process followed by SA Rugby when they decided to get rid of Allister and appoint you. Did some committee get together and discuss the merits and demerits of the incumbent coach and then take a vote, some formal decision to dump him? I am sure there was such a formal decision, it could not have been the decision of just one or two people……….. Or was it? Which brings me to the first question, or series of questions, that we need to ask. When SA Rugby decided to get rid of Allister Coetzee, did they start some formal process to identify possible candidates for the job? Some formal recruitment process? Did you, and anyone else who might be interested in the job, have to fill in an application form and submit a CV, some letters of recommendation, certificates and diplomas, and the like? You know, the normal process any company follows when they are recruiting someone for a senior position? What process was followed by the Board that culminated in your appointment. Were there a series of interviews with prospective candidates? Was a shortlist of candidates drawn up? Were they measured against each other? Was there any selection process whatsoever? What were the criteria that guided this process, if any? Or were you appointed without any recruitment process whatsoever, without any due diligence by the Board? Without any investigation into possible conflicts of interest, nepotism, or internal collusion? In a nutshell, how did you become the preferred candidate, and how were you selected? Do you now have two contracts of employment with SARU? Are you being paid two salaries – one as Director of Rugby and another as Coach? Is there some formal separation between your duties in the two positions? Who do you report to as Director of Rugby, and who do you report to as Coach? You see, to the dumb ones amongst us, we assume that a National Coach would report to the Director of Rugby? Makes kinda sense, does it not? There must surely be some formal infrastructure where the Coach reports to somebody, and we were wondering whether you actually report to yourself? Which hat do you wear, and when? It would be interesting to know whether you have some Performance Clause or criteria built into your contract, and to whom you are responsible in the performance of your duties as coach. Can you enlighten us? Which leads us to another series of questions, ones that are perhaps a little more difficult to answer. You see, we are wondering about your relationship with Frikkie Erasmus. We are told that he is your personal attorney. Is this correct? We also understand that he is SARU’s attorney. Is this correct? Rumour has it that Frikkie Erasmus is the lawyer who negotiates, drafts, agrees and concludes all staff contracts for and on behalf of SARU. Is this true? And did he negotiate and conclude your contract or contracts with SA Rugby? Was he acting as your attorney, or was he acting as SA Rugby’s attorney? Or both? And who was paying Frikkie? Both you and SA Rugby? We are just wondering about a possible conflict of interest there? Thinking about your relationship with Frikkie gave us some more questions that we think might need answering. We are told that Frikkie and you are also business partners in a couple of ventures. Some say that Jurie Roux is also a partner in some of these ventures. There is a whisper that you three together own some shares in an IT company, is there any truth to this whisper? And those same whispers are saying that you three also own shares in a company called either EE Sportconsult Nutrition, or Bokpplus or BokPulse. It is all a little obscure, as whispers often are, and we are not sure which is which. Is this whisper in any way true? What is the difference between EE Sportsconsult, a company in which the Sunday Times reported that you and Frikkie Erasmus are shareholders, and EE Sportsconsult Nutrition, which Frikkie denied as having any connection with EE Sportsconsult? We have read that EE Sportsconsult Nutrition has the exclusive contract to supply the Springbok squad with nutritional drinks and supplements. It was reported back in February 2016 in News24 and in SA Rugby Magazine that your lawyer, Frikkie, was the sole director of this company and that he had somehow been awarded this rather lucrative little contract. Is this true? Is it also true that EE Sportsconsult Nutrition have been granted the right to use the Springbok logo on their products without having to pay any license fee or royalties for the use of that special logo? We know they sell their products through various pharmaceutical chains, and that logo must help a bit? We also need to ask whether you know what the relationship is between Jurie Roux and Frikkie Erasmus? Is Frikkie also Jurie’s personal attorney? Is Frikkie acting for Jurie in that little issue that Jurie has with Stellenbosch University about some funds that went astray? Whilst we do not suspect anyone of wrongdoing, any corruption, or anything untoward, we do wonder about possible conflicts of interest. We do wonder how one attorney can act for three different parties that are all negotiating with each other, and also be a business partner of two of the parties, and then also be the sole supplier of some vitamins and stuff to one of the parties. Just seems a bit weird to the uninformed public, don’t you think? And then there are some questions about that little IT company we heard about. The one that the whispers say you have a share in, along with Jurie and Frikkie, perhaps… The whispers say that this company has an exclusive contract with SA Rugby too, something to do with the provision of technology services. Do you know anything about this? What service, or services, does this company provide to SARU or SA Rugby, or anybody linked to SA Rugby? And are you, or any of the other two, linked to this company in any way? That is about it for now, Rassie. We do not want to burden you with too many questions right now, you have a job to do in rescuing Springbok Rugby from the bottom of the pit that Allister guided them into. We certainly do not want to distract you from that job. Which is why we worry about all these other possible distractions. It cannot be easy to be Director of Rugby, the National Coach, SARU’s IT outsourcing specialist, and a Springbok nutritional advisor, all at the same time. That is just too many hats for one man to wear all at once! Perhaps it would be a good idea if all these rumours, all these whispers, all the innuendo and sideways glances, were put to rest for once and for all? In this time of transparency and new beginnings in South Africa we would hate it if rumours of underhand dealings interfered with your job as Springbok Coach! The problem is that SA Rugby has never been known for transparency, for clear and open honesty towards the public and fans. Perhaps you, as the fresh face of SA rugby, could help your employers fix this problem? We would love to hear the truth, because all these whispers seem to suggest something so similar to the current issue of State Capture in our country. So, is it Fake News, or is it Rugby Capture? 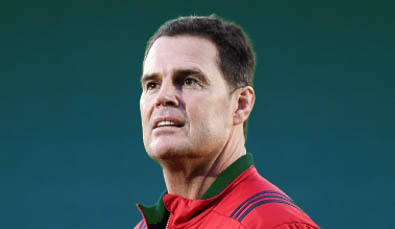 Help us understand, Rassie, so that we can forget about the rumours and focus on the rugby. Next articlePlum gets a Plum Job!